This is my second time going to Kimlau Square for a holiday observance. 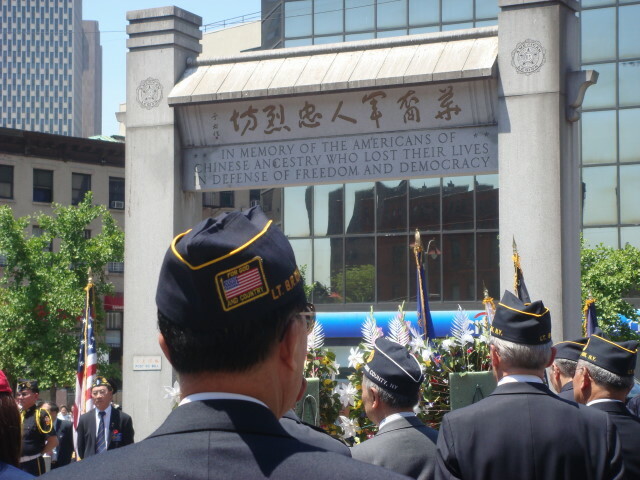 The first time was in 2006 when I was wandering through Chinatown on Veterans Day and ran into the American Legion performing an observance. I was thoroughly touched by it and thought I’d do the same thing this Memorial Day. 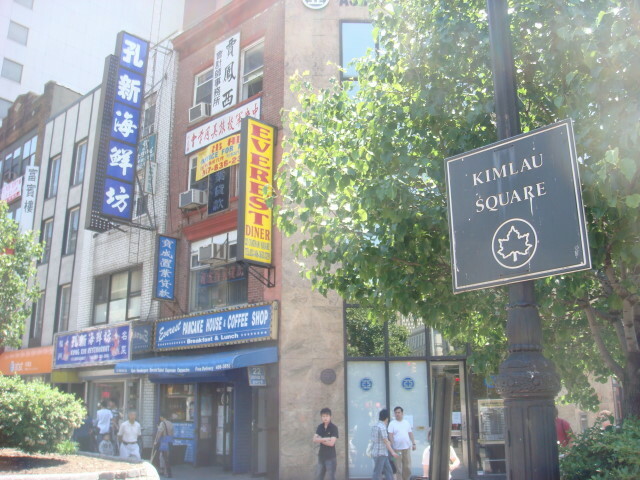 Kimlau Square is another name for NYC’s Chatham Square. It’s located in the depths of Chinatown. I knew the observance was at 12:30pm, but was surprised when I got there and saw virtually no one. There were a few other people scattered around, but we’re only talking five or ten people. I wasn’t the only caucasian, but I was certainly one of the few. A bit late, the Vets arrived. It was a minor parade. I hadn’t expected that. I just thought they gathered and celebrated and then went to lunch. It was just the American Legion. I didn’t expect and didn’t get fancy stuff. 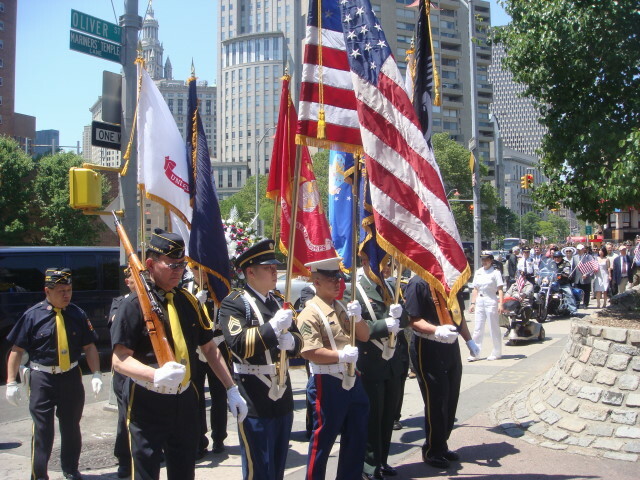 Just a small marching band, a color guard, and a bunch of veterans. Good enough for this day. More than good enough. Here are some of the dignitaries. I don’t know how many vets were there. Maybe 70 to 90? Maybe. The best moment came when the judge was speaking and he called out for a show of hands for those who served in the different wars. He called out WWII (a few), Korea (quite a few), Vietnam (a whole bunch), Persian Gulf 1 and 2 (some). 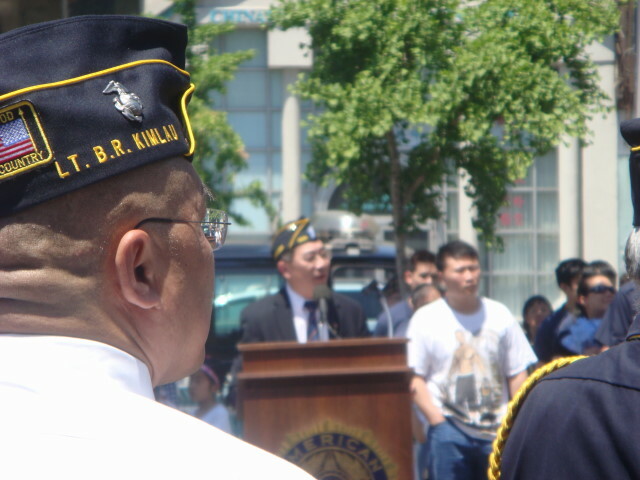 When he called out “Korea”, an older vet near me whooped out “That’s mine!!! !” and started waving and kicked up his feet. I wish I had been quicker with my camera. It was a good moment. Lt. Benjamin R. Kimlau (class of Dewitt Clinton High School 1937) was a Navy pilot killed in WWII. I really have never thought of the square as Chatham Square. 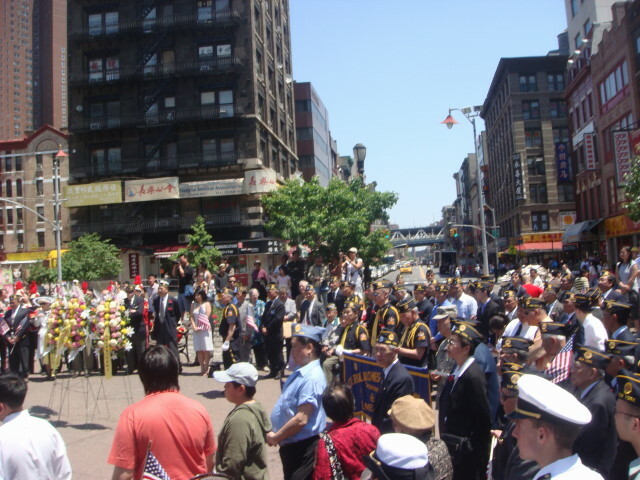 To me it is and always will be Kimlau Square, a place that I wandered past one day and stuck around for a very memorable Veterans Day and now for an equally memorable Memorial Day. A confession. 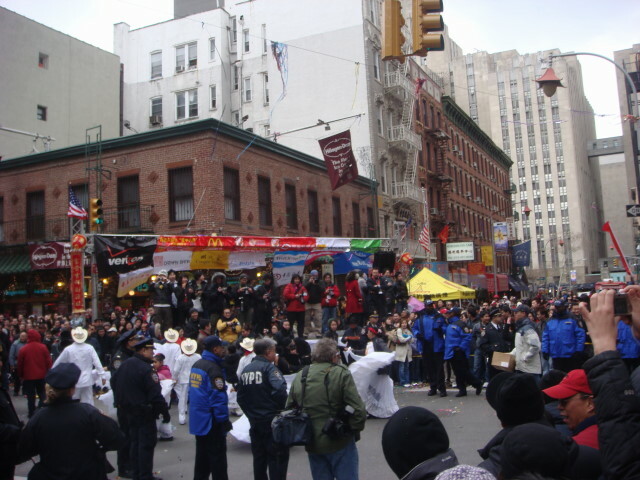 I always comment about the size and growth of Chinatown and how it is enveloping all of Little Italy. I’ve wandered throughout Chinatown, but I had never, ever just gone through Chinatown to reach the other side. It’s a weird “confession”, but I was noticing that my own ideas of Chinatown seemed to have it go all the way from Canal Street to…well, I hadn’t given it a huge amount of thought. There is an “end” to Chinatown. As I went through Chinatown recently, I decided I’d travel until I reached the other side. I knew where it was, but just had never made that particular transition (I’d always turn around near the bottom and head back up). 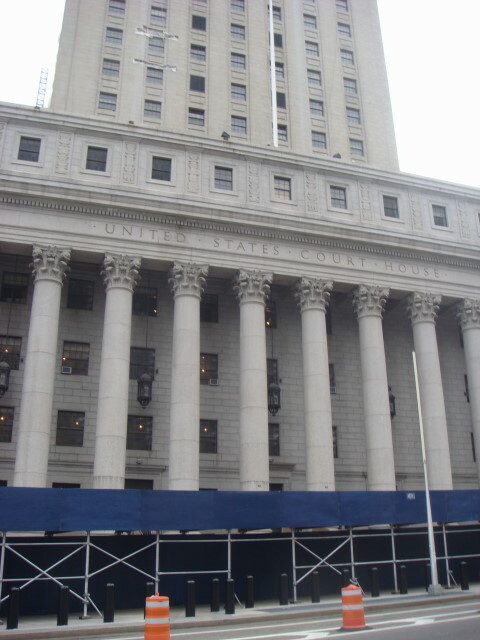 It ends in the government area of Manhattan, right near where the courthouses are that you’ve seen on Law & Order and every other NYC cop/lawyer show when they want to show the institutes of justice in the City. There are two big ones, plus a plethora of standard government office buildings. 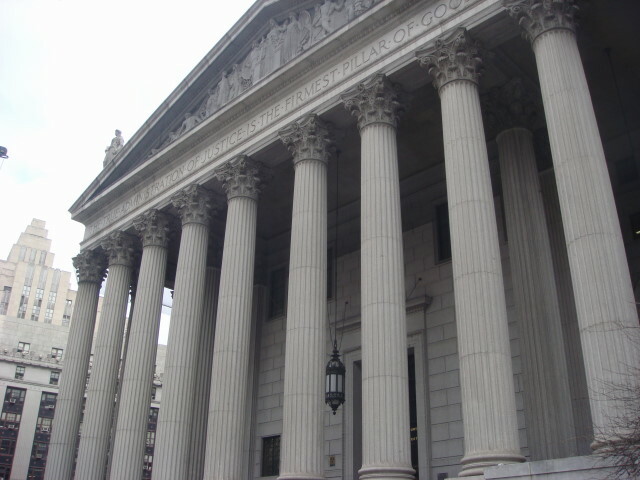 Right across the street from them is Foley Square. 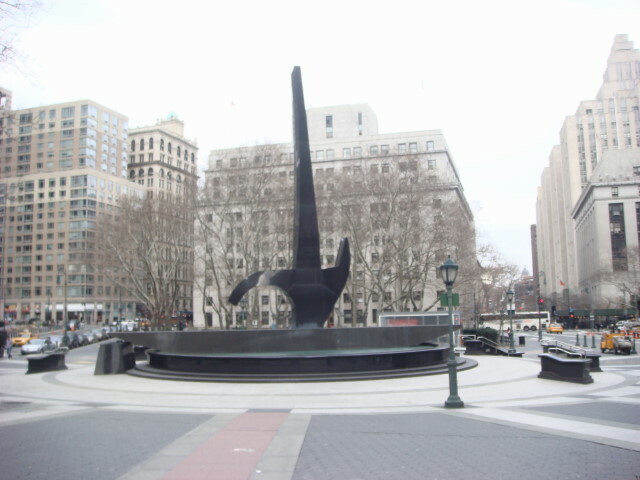 The sculpture in the fountain is based on something called a Chi Wara, a type of African headdress that itself is a symbol of the antelopes of West Africa. The writeup on the Chi Wara talks about how it symbolizes the antelopes which symbolize men and women working together to produce a good harvest. Well, I’m sure they’re also being symbolic to mean something other than successful farms in Lower Manhattan. Forgive me. I’m having too much fun with the idea of a symbolic symbol symbolizing harmony. Is the harmony symbolic of something else? Incidentally, Foley Square is named after one of those behind-the-scenes-politicos of yesteryear who was the mentor of Al Smith, one of Gotham’s great mayors. 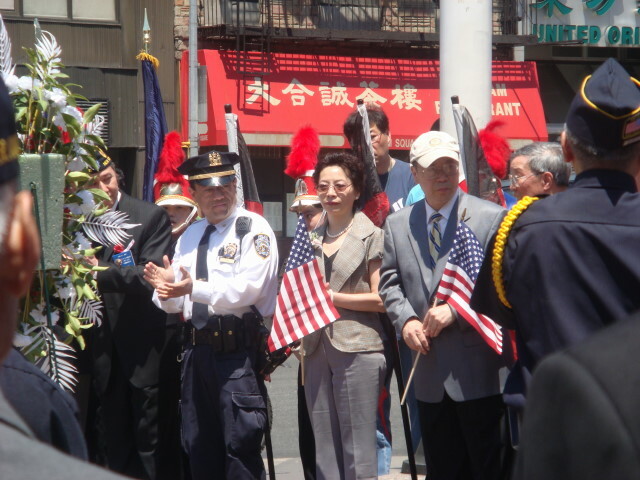 So, I wanted to write about going through Chinatown and hardly said a word about Chinatown itself. Sunday’s parade was sort of fun and had a number of interesting moments. Being in the tight confines of Chinatown with a million or two or three close up against you can bring out some interesting issues. During the crowding time, some girls came up behind me. I never saw them, but they didn’t sound Asian and I doubt they were. They talked like any teenage girls in America, with the exception that they wanted to GET THROUGH the crowd and were doing everything they could to do it. Mostly by being obnoxious and saying they needed to GET THROUGH. At least one of the two (or maybe three) of them ended up directly behind me and kept pushing at me. It wasn’t as if I could have moved very easily but the poking and prodding was enough to get me to stand my ground. After a while they drifted off, although they may have been picked up by the crowd and carried away for all I knew. 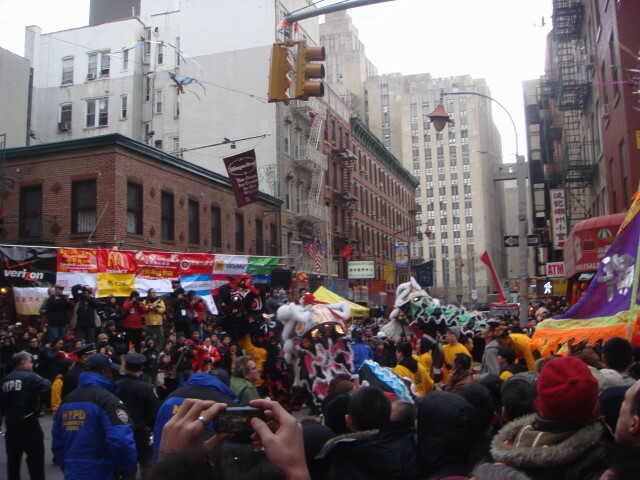 What everyone wanted to see was the dragon dancing. To do the dance, you create/buy an elaborate head of a dragon and then get a bunch of your friends to line up behind you with the “body” of the dragon being a long line of fabric. Another bunch of compatriots start banging away on drums and cymbals in a rhythm and you twirl all about. In the best of the displays, there are two or more dragons doing fake battle against one another. We had those. All types, combinations, and quality of dragons. Below is one of the times that there were multiple dragons. Unfortunately, they were usually pretty low to the ground and fade into the background a bit. But they did rise up at times. 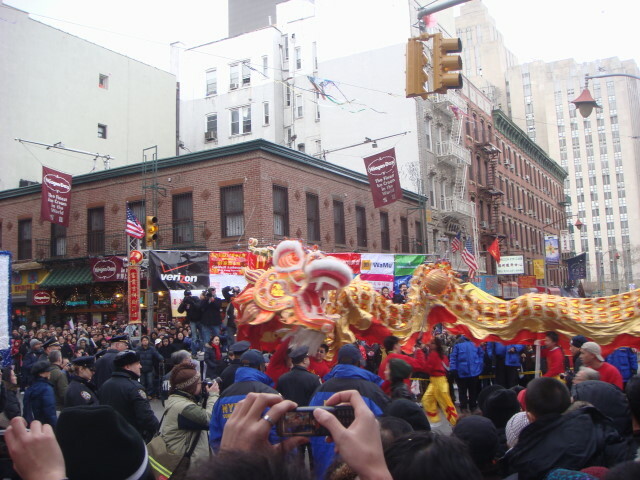 During the parade, there was one time that I think there were four or six dragons in front of the reviewing stand at the same time. But they were just too low for any sort of decent photo on my part. But there was one dragon that was superb. Just wonderful. 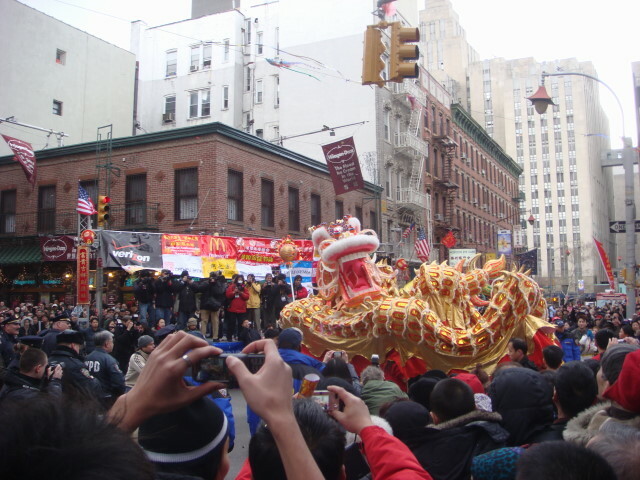 The dancers went around in circles several times showing the dragon coiling and uncoiling. Until they straightened out and went down Mott. At the very end of the parade, a view came that I had not expected. I don’t think anyone expected. Heck, even the people in the display were probably dumbfounded by it. Cowboys! Or, rather, Caballeros! The music sounded Mexican to me, but the last display identified their country of origin as Columbia. Maybe they just like a good party. After the parade ended, I went back down Bayard and saw some of the participants posing for pictures. Yes, I finally found another parade. It’s been a while. I left late for the 1pm parade and knew it would be tough getting a good viewing spot. Chinatown’s tiny little streets and people’s fascination with dragon dancing and the like meant I wasn’t going to find a nice vantage point. 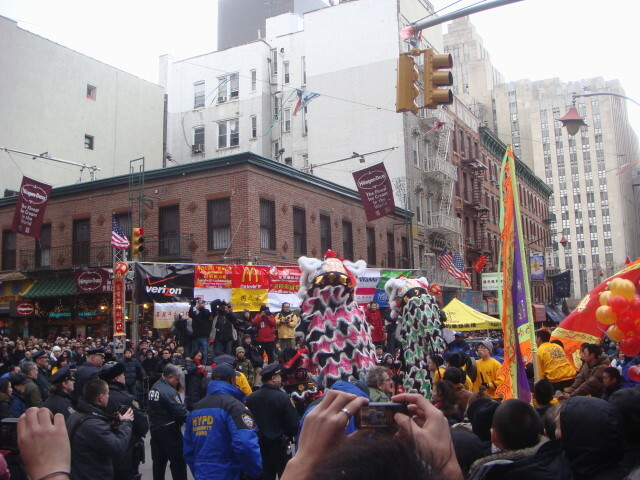 When I got there, here’s my initial viewpoint of the parade. 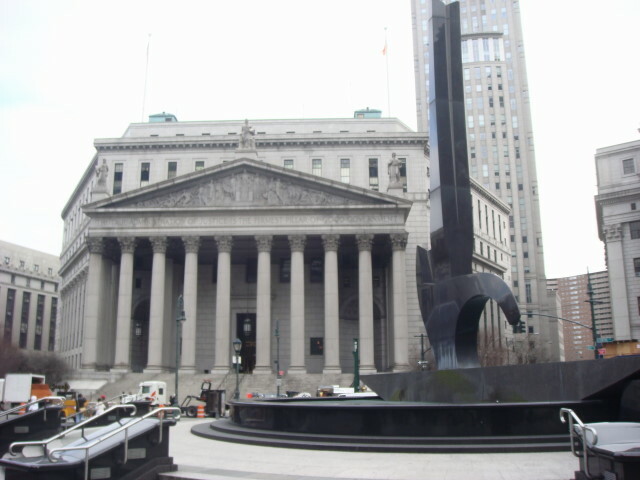 I was at the corner of Bayard and Mott Streets, right where the reviewing stand was. That meant a great place, but lousy positioning on my part. First, I was way too far away and, second, I was across the street from the reviewing stand which meant that the paraders were facing them, not me. 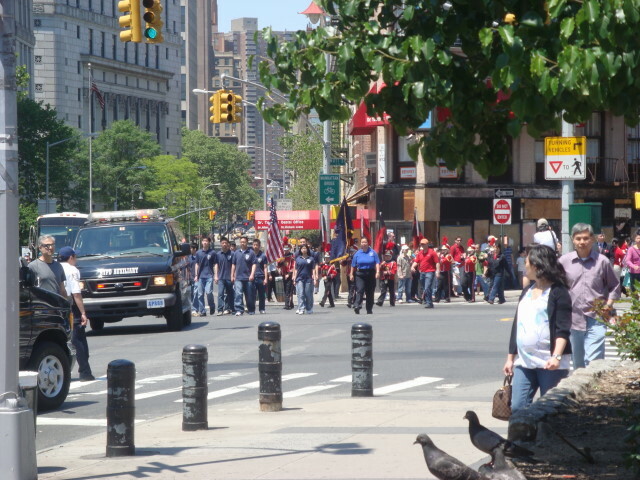 The parade itself isn’t one of the impressive ones that NYC can generate. Instead, it has a much “homier” feel despite the fact that there are a lot of politicians and a lot of sponsors to the event. 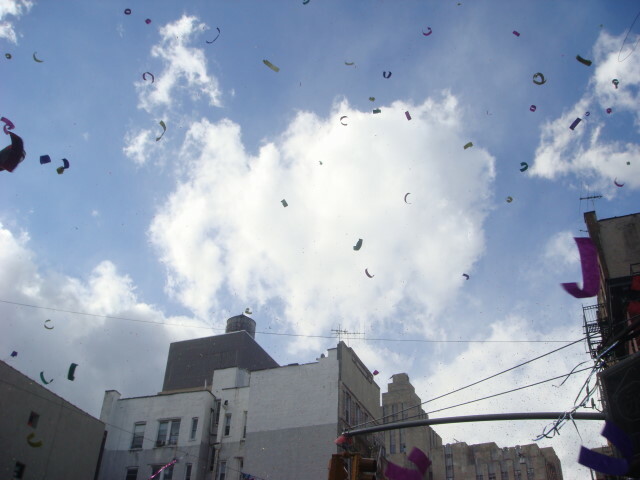 The one item that you can’t ignore in a Chinatown parade is the confetti. It’s everywhere. Near the reviewing stand, they had some fan-like devices that occasionally would shoot it into the air. It didn’t happen all that often, but it did thrill the crowd when it went off. 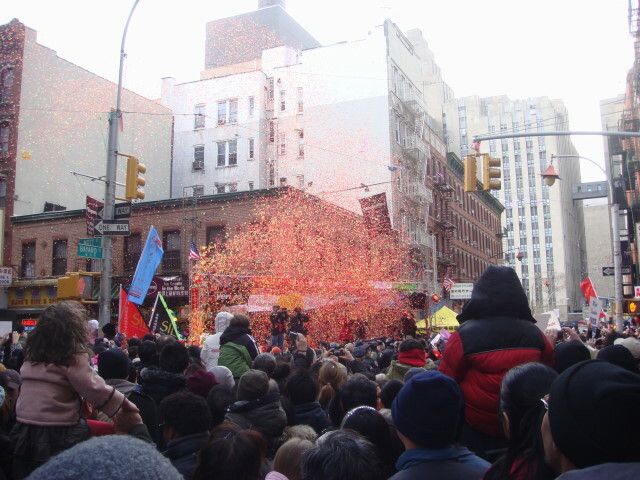 Usually, the confetti was sent out by people in the parade using a variety of handheld launchers. The fact that it was a windy, windy day meant it was terrific. I don’t think there was a moment that the sky wasn’t filled with the stuff. It doesn’t come out too well in the photos, but here’s a taste. It was wonderful. And at times a bit disconcerting. Sometimes the confetti was more in the form of streamers and you’d find two and three foot strands floating down. At one point, some fell around my neck and I was getting ready to pull it off when it tightened on my neck (not particularly tight, but noticable). I couldn’t figure it out, but it turns out the guy behind me was draping it and some other around his own neck and he was pulling mine in a way that it pulled at my throat. No, I wasn’t almost throttled or anything. Just one of those moments that you don’t expect. The place was jammed. It was beyond jammed. It was one of those NYC crowds that, at times, you can’t even move your arms. Just a sea of humanity with each and every one of us trying to get just a slightly better view. In the above picture, you may notice the guy has a cigarette. It just seemed so out of place. 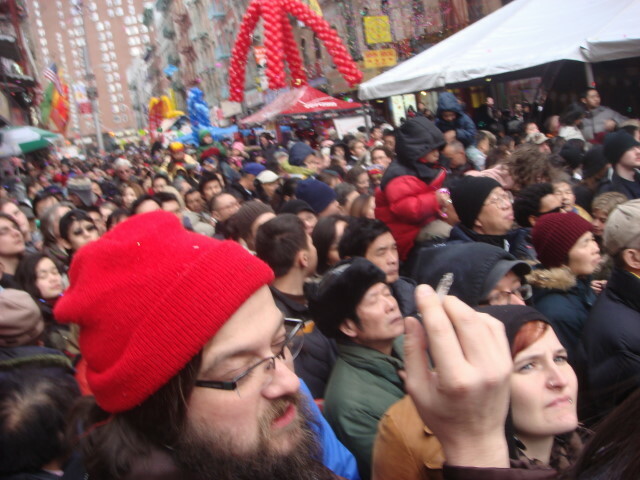 But later in the parade, of all things, some guy next to me started smoking on a pipe. I haven’t seen that in years. The parade itself lasted a little around 90 minutes or so. There were a number of floats. 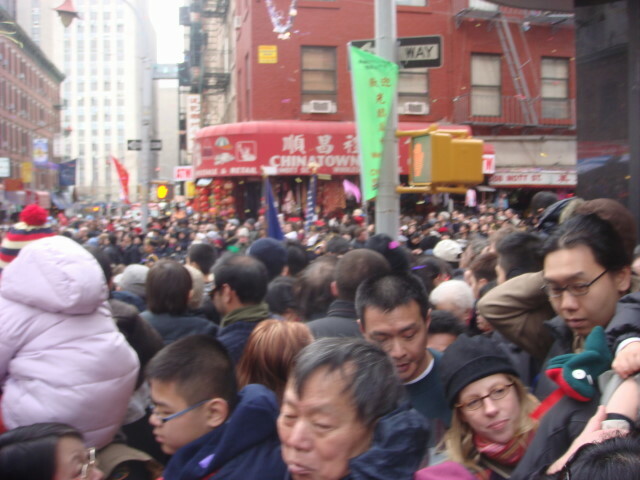 About midway through the parade, the crowding became extreme. And not in a good way. I don’t know what was going on although I saw a larger than usual stream of people behind me at one point. 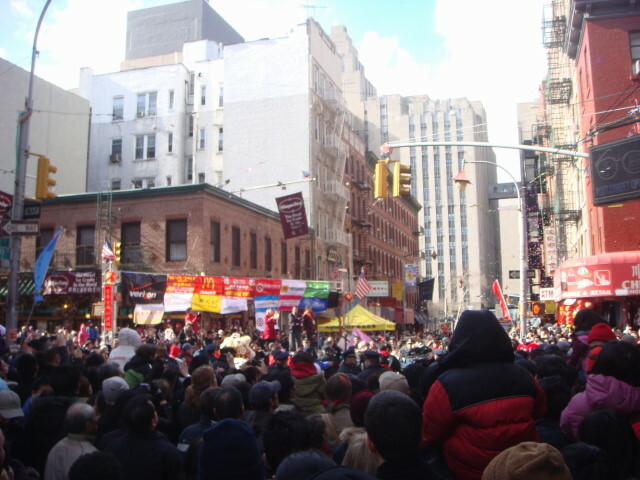 Nevertheless, the press of the crowd more than doubled. It was to the point that I couldn’t push back with more than a little and I was almost being forced off my feet from the swell of the crowd. The cops started shouting out for people to move back and not to press forward. But they weren’t anywhere near me. In fact, I wasn’t sure what the meant by “back” at that point. I had to re-plant my feet at least three times as I was pressed into the people in front of me. After a few minutes, the pressing lessened significantly…and I pushed forward to a better spot than I had before. 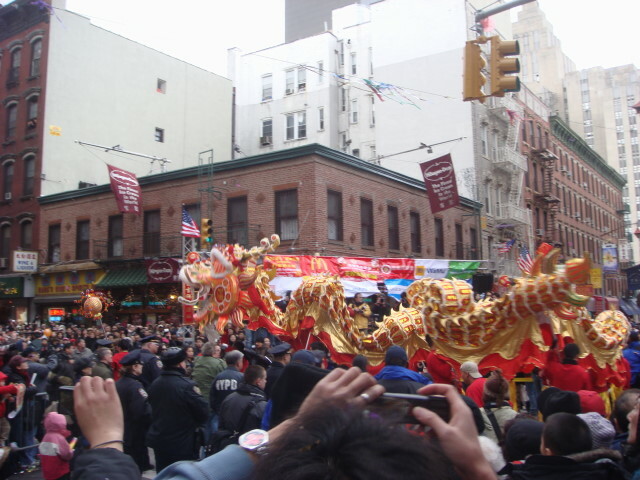 So, the parade had three things of interest to me: the crowds, the confetti, and the dragon dancing. This post hasn’t had any of the dragon pictures. 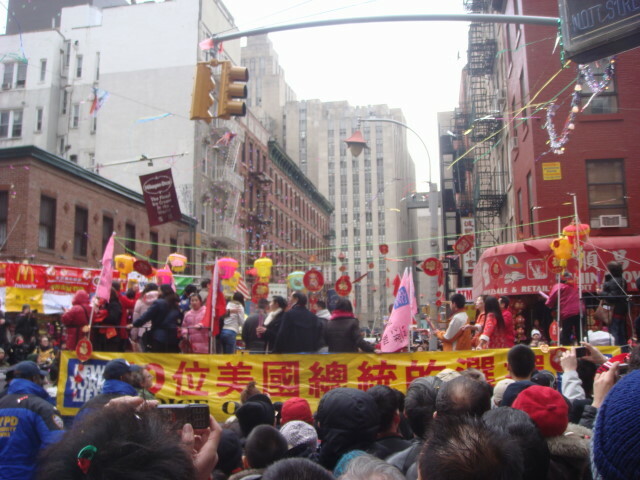 With a population as big as NYC, you know that there are communities celebrating something at almost every day of the year. 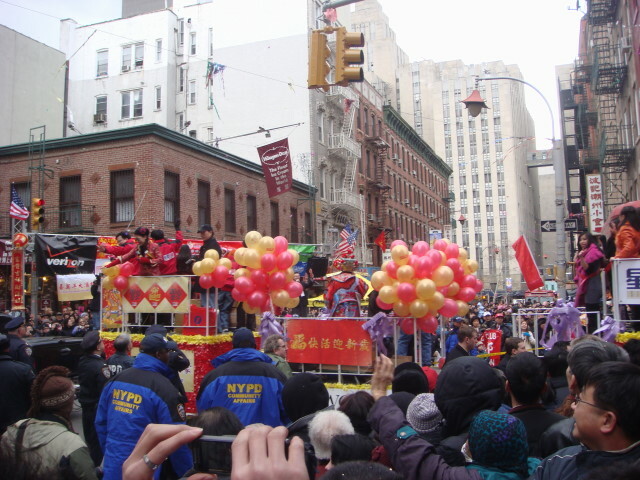 Well, the 7th is Chinese New Year and I was down in Chinatown over the weekend looking at their first preparations for the festival. 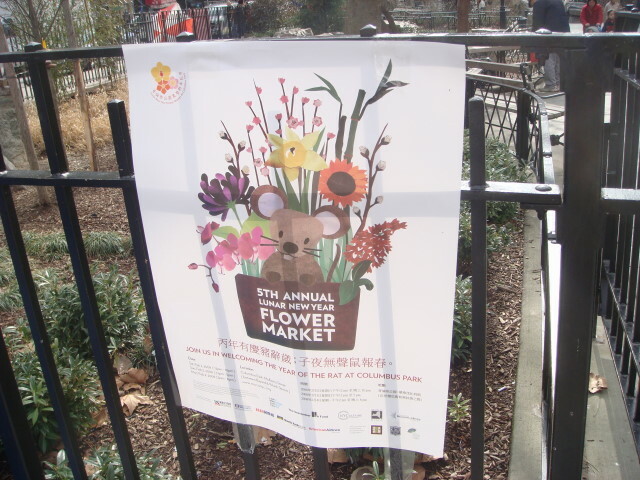 It was the 5th Annual Flower Market. 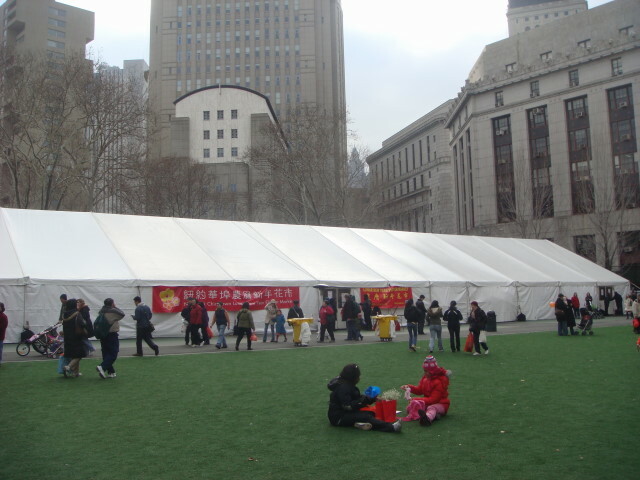 The event was held at the lower edge of Chinatown in Columbus Park. It didn’t consist of much, but the tenting was a nice touch. 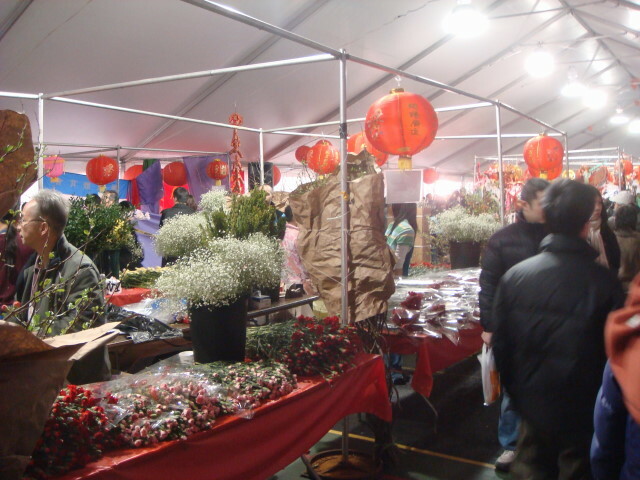 I did get inside and found a rather crowded and festive group doing nothing but…selling flowers and plants. 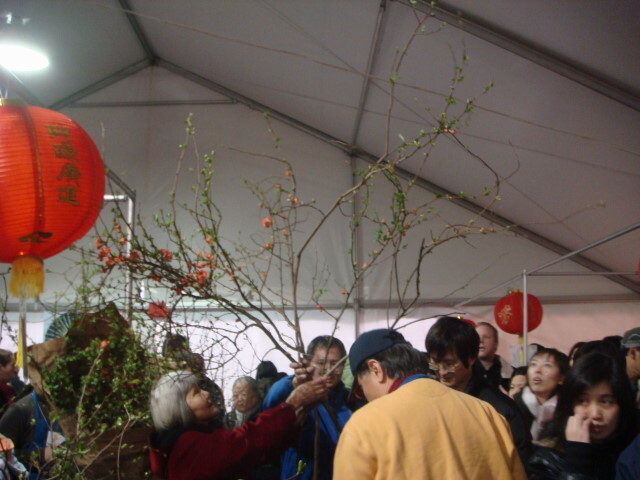 Lots of people of all sorts were there, predominantly Chinese but not exclusively. As you can tell, they were having a good time. And what year will it be? 2007 was the Year of the Pig. Let’s follow up with an equally interesting animal year! Yep. 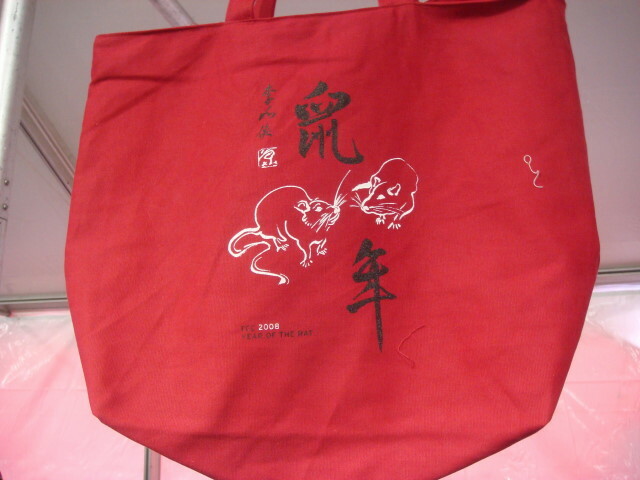 2008 is the Year of the Rat! A good NYC kind of year, I’d say. On the other hand, and in news more immediate to me, it’s Ash Wednesday. That’s the traditional beginning of Lent. I saw a lot of people with the sign of the Cross on their foreheads. As for me, I’m a little too low an Episcopalian for it. Of all the neighborhoods I go into, the one I’m least likely to eat in is Chinatown. I love Chinese food and Chinatown boasts some great Chinese eating, but I’m generally put off by the smell from the grocery stores. I’ve mentioned this issue in an earlier post. 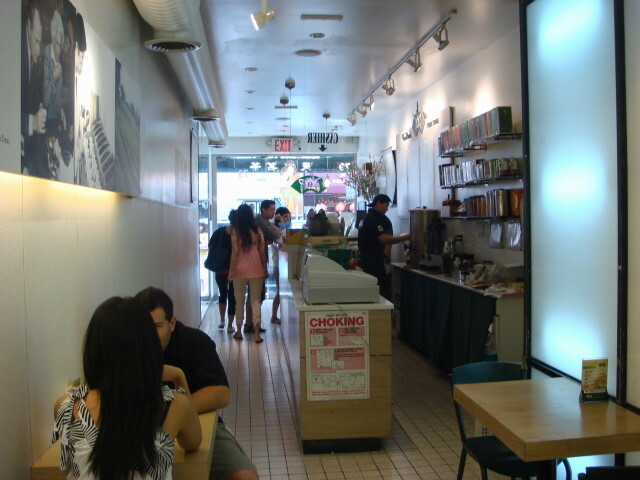 But there’s one place in Chinatown that I love to go to and partake of the comestibles: Ten Ren Tea Time. It’s a tiny place, but kept impeccably clean. 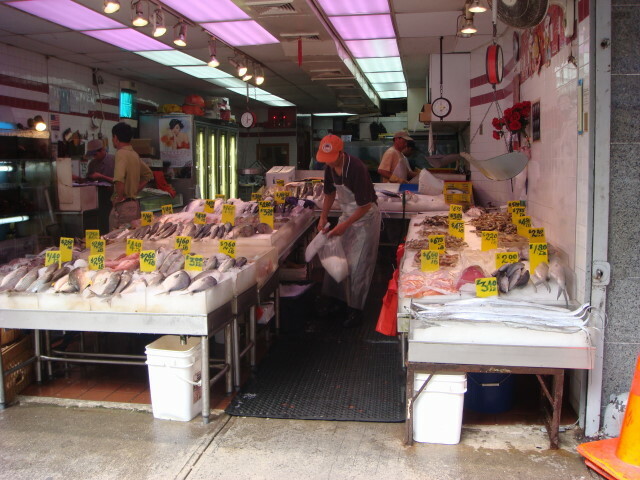 It’s on Mott Street, just to the south of Canal Street (it’s on the west side of Mott). Tiny in width, but about 50 feet deep, there’s enough seating for maybe 15 people. And all they serve is tea. Lots of different teas, but for me there’s only one: bubble tea. That’s the “passion fruit bubble tea”. I’m mostly fond of the mango. Okay, maybe bubble tea is old hat to you, but most of the people I’ve taken there, or tried to take there, have been blissfully unaware of what it is. Okay, it’s tea….with bubbles. A lie! Actually, if you look at the picture, the dark stuff at the bottom is the “bubble” part of the tea. Every cup gets the same set of bubbles. And the bubbles are large pearls of tapioca. If you can’t tell, the straw in the cup is huge. It’s specially sized to pull in the tapioca bubbles just right (or, more likely, the bubbles are sized the the oversized straw). Whatever. It’s a wonderful, wonderful combination. This isn’t a real easy post. 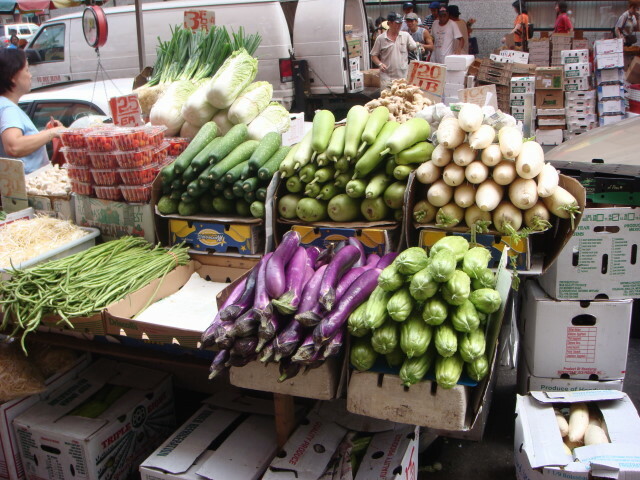 In my LES post, I confessed that I find nothing “cool” about Chinatown. I don’t. That doesn’t mean I don’t enjoy it, but I don’t get a frisson of anticipation when I go there. What I get is a stench. This is coming from a man with a minimal sense of smell. Chinatown stinks…odorwise. In other ways, perfectly enjoyable. It all depends on how much of a connection there is between your sense of smell and your sense of adventure. 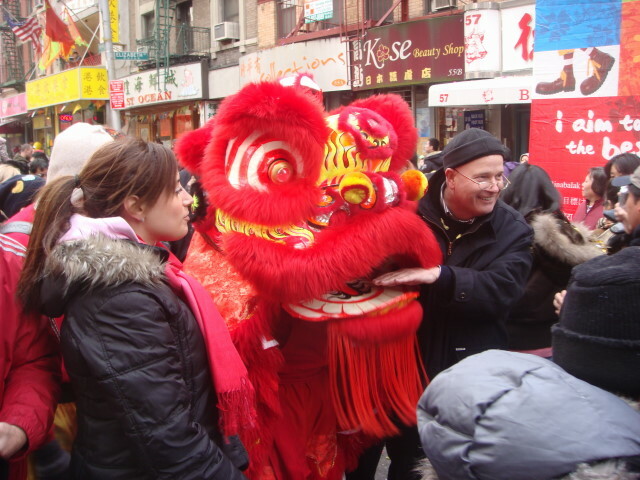 Because you can explore Chinatown for a long, long time. Okay, where’s Chinatown? Uhh…..southern Manhattan. It’s kinda all spread out and amorphous. It is growing at a pretty good clip from what I see. It isn’t all of southern Manhattan, of course. The Financial District and the government district are still alive and healthy. 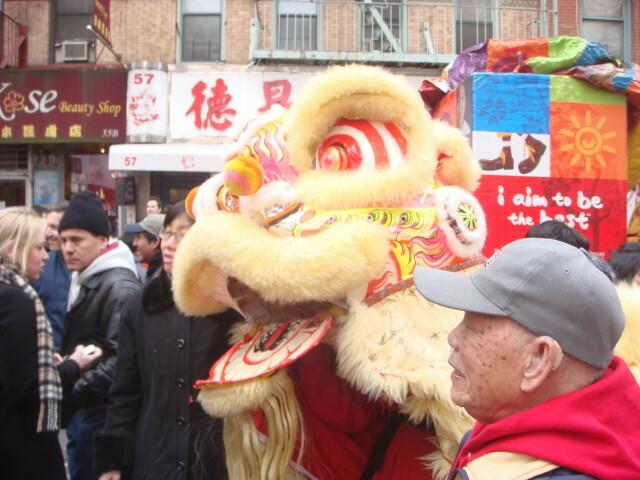 Amongst Manhattan neighborhoods, Chinatown makes the least allowance for the rest of America. There’s at least one McDonalds on the periphery and I know there’s a Subway Sandwich Shop somewhere right in the middle of the place, but they are just sort of add-ons if you know what I mean. A lot of the street signs are actually in Chinese script (alongside the western alphabet name of the street). And what stinks? The grocery stores. Mostly the meat places. They’re all over the place. The locals like their food fresh. Lots of the stuff is still alive. I’ve seen buckets of moving crabs and swimming frogs (with the occasional dead frog floating on the surface). There’s lots of relatively large fish swimming in aquariums, ready for the net and dispatching. Already dead fish are generally kept on ice, but that doesn’t stop the smell. I’m hopeful that I’m just smelling the stuff that dripped yesterday or so. 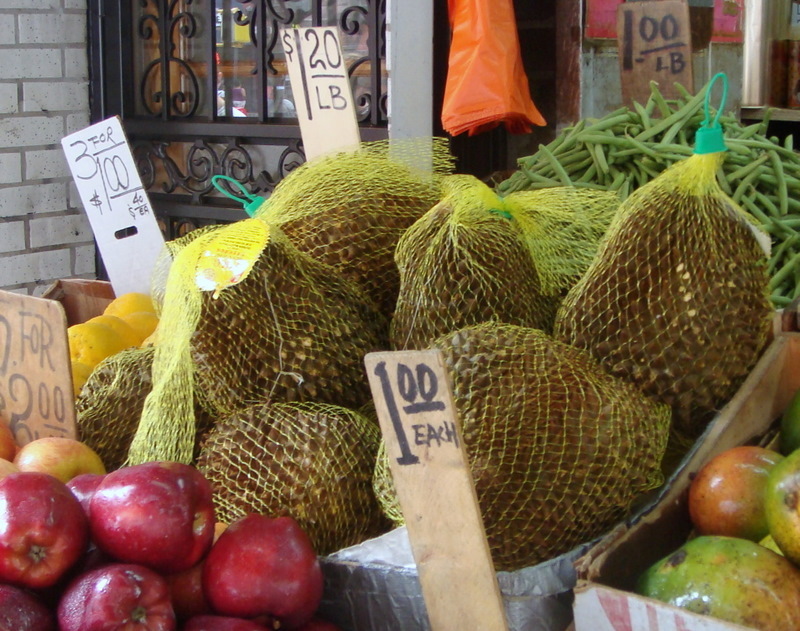 The grocery stores are of several sorts. 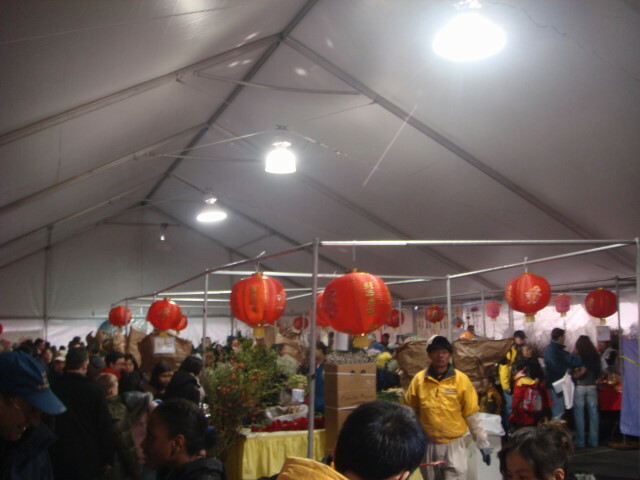 There are indoor ones, which I really don’t want to go into, and there are the outdoor stalls. They’re interesting. 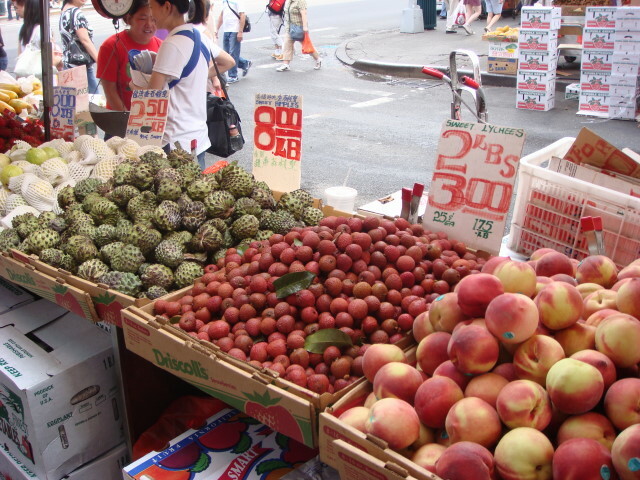 Okay, on the right are some plums, the center are Lychees, and the right….my notes say “Logan Berries” but the sign says “Sweet Apples”. I don’t think either fits. And, something called “Durian”. Apparently it’s a fruit. I’ve seen it many times but I just saw some “foodie” show that described it as a horrible-tasting/smelling food. I think the commentator (Andrew Zimmern) said it smelled like feet and tasted similar. That’s it in the yellowish mesh bag. It looks like a mutant pineapple. At present, I’m not feeling adventurous enough to test the description. 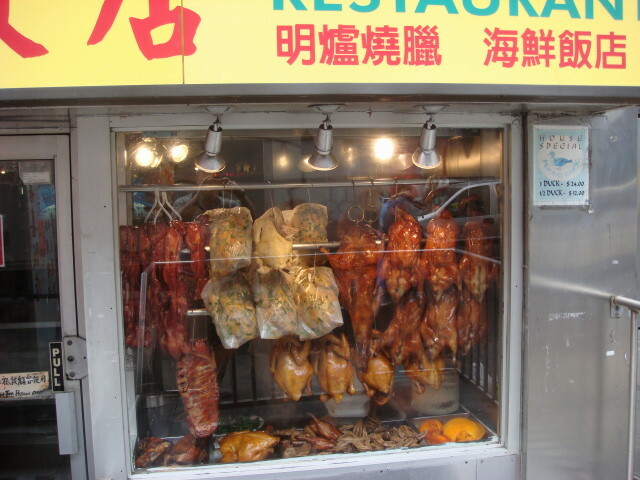 And no post on Chinatown would be complete without a shot of dead poultry in the window. Okay, that’s a baldfaced lie. Future posts may not have one at all. But you would have complained if I didn’t include at least one duck picture somewhere.